Is the War on Terror really a war against Islam? After 9/11, this was a charge leveled regularly at the policies of President George W. Bush, who found numerous creative ways of denying it. “Ours is not a campaign against the Muslim faith,” he insisted while the ruins of the World Trade Center still smoldered. “The face of terror is not the true faith of Islam.” With visits to mosques and dutiful Eid messages, Bush insisted that the 9/11 attackers were “traitors to their own faith” who had tried “to hijack Islam itself.” It didn’t help the president’s cause that so many conservative commentators fudged the distinction between what Bush called “true Islam” and what others described as “fascism with an Islamic face,” as Christopher Hitchens wrote in this magazine in 2001. Even before the recent attacks in Paris, there was no shortage of support in Europe for the view that Islam is at war with modernity and Western values. “To hell with their culture,” Richard Dawkins declared on Bill Maher’s Real Time last October, raging that Islam’s putative barbarities—“a woman who’s forced to wear a beekeeper suit in the hot sun,” Maher offered—are given a free pass by the so-called Jurassic left. The United States has remained fertile ground for Islamophobia. While Barack Obama’s reliance on drones rather than occupying armies has put a new face on US imperium in the Middle East, conservative commentators have presented the rise of the Islamic State in Iraq and Syria as a vindication of their warnings about jihadist expansionism. According to a YouGov/Huffington Post poll this past spring, 55 percent of Americans had an unfavorable view of Islam, a statistic that may explain Donald Trump’s campaign pledge to ban Muslims from entering the United States. As for the president, his willingness to assassinate “Islamists” from Afghanistan to Somalia seems not to have persuaded the far right of his loyalties. Does anyone believe that Ben Carson’s extraordinary remarks on Meet the Press last September—“I would not advocate that we put a Muslim in charge of this nation”—were unconnected to the persistent attempts of the “birthers” and their allies to uncover the true loyalties of Barack Hussein Obama? Those who remember the final years of the Cold War—or even, say, the Clinton presidency—will know that there was a time in American history when “radical Islam” appeared some way down the news agenda, if it entered popular consciousness at all. In the aftermath of 9/11, journalists and scholars reminded us of American support for the mujahideen in Afghanistan and the long relationship between the US government and the ultraconservative rulers of Saudi Arabia. In American Apostles, Christine Leigh Heyrman aims to recover a much earlier episode in this story: as the subtitle puts it, the moment “when evangelicals entered the world of Islam.” She follows a series of US missionaries who, in the early 19th century, abandoned the boosterism of the American Republic for the alien and baffling landscapes of the Middle East. Seeking souls in the broad expanse of the Ottoman Empire, skipping from Anatolia to Cairo to Jerusalem, these men married an intense study of Islam with a fervent hope that the peoples of the region could be brought to Christ. Heyrman carefully explains how these crusaders became fascinated by the potential of their mission, but the book’s most thrilling sections recount their struggles when things didn’t turn out as they’d imagined. The United States paid a fee to the Barbary States for the safety of its commerce until 1815, when escalating demands for US tribute and increasingly brazen attacks by Barbary pirates persuaded President James Madison to adopt a different approach. He sent 27 warships, battle-hardened by the War of 1812, to demand the return of American captives and property. This early experiment in gunboat diplomacy was wildly successful. The Barbary States granted more favorable terms than they had offered to any European nation, and the United States secured free passage for its sailors at no further expense. British and French officials marveled at the bravado of the upstart republic, and North Africa soon fell under the sway of European imperialism. But there’s little evidence that Americans saw this as a triumph of Christianity over Islam. Instead, coming on the heels of another war with Britain, it suggested that the United States had decisively established itself in the international system. The hero of Heyrman’s book is Pliny Fisk, who became one of the first US missionaries in the Middle East. Fisk was one of eight siblings born into a poor farming family in western Massachusetts in 1792. His sharp mind and earnest piety offered a way out of his family’s hardscrabble existence. He attended Middlebury College, where he labored valiantly to catch up with his expensively educated peers; and then Andover Theological Seminary, where he trained to become a Congregational minister. Fisk came of age at an important moment in the history of American education and religion. Universities like Harvard, Yale, and Princeton had begun to distance themselves from both the old-school Calvinism of the 18th century and the new wave of religious revivalism that was breaking over the Republic. The upstart Methodist and Baptist denominations insisted that preachers could save souls without first obtaining a graduate degree, but the practitioners of the “New Divinity”—mainline Protestants concentrated in New England—maintained the importance of a proper education for the clergy. Andover was one of several new seminaries that emerged in the early 19th century to save would-be clergymen from religious liberalism and hayseed evangelicalism. The young men who moved through these seminaries in the 1810s were expected to do much more than win souls in the United States. In 1810, the Congregational Church founded the American Board of Commissioners for Foreign Missions, the nation’s first major missionary organization. In 1812, the ABCFM established its first outpost in India. By 1835, it had sent missionaries to Sri Lanka, Hawaii, China, Indonesia, Liberia, and South Africa. For Fisk, whose horizons had once been bounded by the Green Mountains, this vista must have seemed limitless. For the sponsors of the missionary enterprise, on the other hand, a global stage would advance a more intimate drama: By reaping endless harvests in the mission fields of East Asia or Africa, New Divinity supporters would consolidate their brand in America’s crowded religious marketplace. The strength, and weakness, of American Apostles is that it doesn’t make this larger drama—the battle to found a global empire—its subject. Other recent histories of the American missionary movement, like Emily Conroy-Krutz’s Christian Imperialism, explore the vast reach of the ABCFM’s overseas activities in the early 19th century. For Heyrman, the story belongs to Fisk, whose wonderfully detailed journal she mines deeply throughout the book. This sharp focus offers an intimate and compelling glimpse of one missionary’s hopes and fears. But it also makes it harder to see his story as a distinctively American one. For one thing, Fisk’s experiences of the Middle East were heavily mediated by the British missionary movement. He prepared for his trip by reading British accounts of the region’s spiritual potential and challenges. When Fisk and his colleague, Levi Parsons, reached their staging post of Malta in 1820, they happily sheltered under the wing of William Jowett, the local representative of the Church Missionary Society of London. Jowett could hardly fail to impress the Americans: He was handsome, affable, and usually accompanied by his clever and beautiful wife, Martha, who knew at least as many languages as her husband. The friendly deference that the Americans offered the Jowetts could serve as a metaphor for the broader US presence in the Middle East. It was British influence that created the narrow space in which foreign missionaries could operate, and the United States was very much the junior partner in the pursuit of religious imperialism. Even the British understood that their proselytizing powers in the Middle East were limited. Unlike Hawaii or China, where missionaries could work with a freer hand, the Middle East offered a complex and carefully regulated terrain for missionary activity. Heyr­man’s subtitle is misleading in this respect: “The world of Islam” is a poor description for an empire in which Muslims lived alongside Jews, Greek Christians, Armenian Christians, Catholics, and many other minorities. It would be exaggerating the point to say that the Ottomans oversaw an empire of inclusion, but until the mid-19th century they maintained more than a dozen separate mercantile, legal, and religious systems for the minorities under their sway. This created an obvious opportunity for British and American missionaries, who assured the Ottomans that they would target Catholics and Orthodox Christians rather than Muslims. To Pliny Fisk, virtually the entire population of Smyrna needed saving: “We see now before us a city containing more than 100,000 souls,” he wrote in 1820, “led captive by Satan at his will.” But unless they were willing to embrace martyrdom, Protestant missionaries would be unable to make a play for the Muslim majority. The idea of bearing witness in Cairo or Jerusalem might have stirred the spirit of students at Andover, but it was “out of the question” for the young Americans and Britons stationed in the Middle East. There was to be no preaching in the marketplace or outside the mosque for Fisk and his associates, who contented themselves with learning local languages and studying the Koran. Their principal means of evangelizing was the circulation of missionary literature, via translations of the tracts and pamphlets that had been the backbone of proselytizing in Britain and especially the United States. Heyrman concedes the paradox of attempting to convert peoples with low levels of literacy through the printed word. Many of these tracts—which appeared in nearly a dozen languages—were aimed at the substantial non-Muslim populations of the region, whose spiritual welfare was beyond the immediate control of Ottoman officials. The translation of Christian materials into Arabic (and, via lithography, into the ornate calligraphy that graced copies of the Koran) suggests a broader ambition among the missionaries. Fisk was initially thrilled to see how easy it was to persuade the locals of Smyrna to take one of his pamphlets; he was less thrilled to discover that pharmacists were using Protestant tracts to wrap medicine, or that the Good News was being torn and folded by gun owners to create rifle cartridges. With limited opportunities to complete his mission, Fisk spent more and more of his time trying to understand Islam. Heyrman’s account of his efforts is especially impressive, chronicling a process that she calls (in one of the book’s many felicitous descriptions) “othering” and “brothering.” American missionaries arrived in the Middle East with an unshakable faith in the Protestant message and a passionate determination to win souls. While Pliny Fisk could easily characterize Smyrna as a city bound for hell and Islam as a false religion, he also brought with him the universalist assumption that Muslims (and the other peoples living under Ottoman rule) were open to reason and persuasion. American missionaries spent countless hours in conversation with imams, Arabic teachers, and other learned men, and envisaged these keepers of the faith becoming the beachhead for a general conversion effort. But the Muslims they encountered seemed absolutely immovable in their faith—disconcertingly so, given the motley and inconstant state of religion in the United States. If American Apostles sometimes overreaches—as in its suggestion that Fisk and his associates feared the world might fall to Islam—it often captures sharp truths, like the missionaries’ pointed nervousness about the piety of Muslim men. Heyrman reminds us that women were usually seen as the most reliable carriers of spiritual enthusiasm in American religious revivals. In the Middle East, by contrast, it was men who took the leading role in sustaining a public culture of religious devotion. Since men controlled the economic and political sphere in both the Ottoman Empire and the American Republic, the missionaries feared that Islam might have considerable advantages over the New Divinity. The heart of American Apostles is Fisk’s five-year voyage through the reaches of the Ottoman Empire and his effort to understand the lure of Islam. Heyrman can’t quite resist the temptation to show Fisk becoming unmoored as he peers into this foreign world. During his stay in Jerusalem from 1823 to ’24, he makes a trip to a particularly beautiful mosque in Acre, in what is now northern Israel. “Lost in admiration,” Fisk briefly seems to embrace the aesthetic and spiritual affinities that link his own faith to that of the people he’s come to convert. Heyrman depicts the American retreating from the edge of this dangerous insight, and there’s something pat about the suggestion that Fisk nearly succumbed when dazzled by the mosque’s sublimities. But her underlying argument—that Fisk was a rapt observer of this alien culture—is an important one. 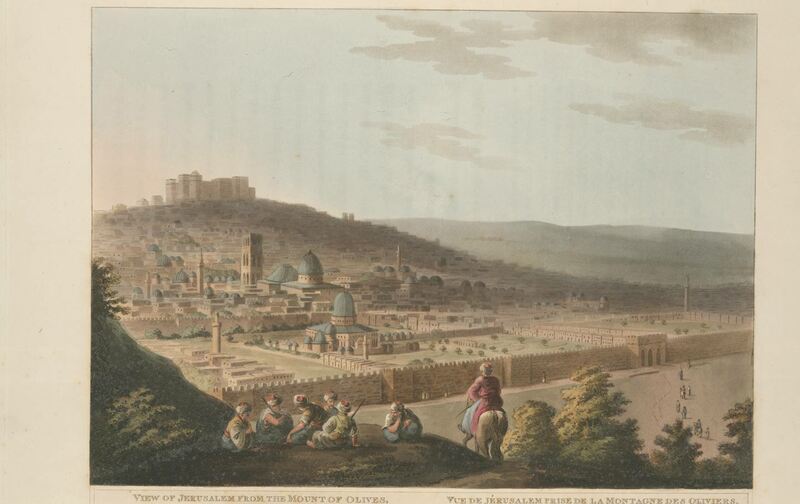 In 1823, a rival to Fisk came to Palestine. His name was Jonas King, and he was another New England missionary. The two men knew each other at Andover and traveled together through the Middle East, but Heyrman styles them as opposites. Fisk’s patient bookishness seems even more appealing when set alongside King’s bald machismo. While Fisk turns inward in his spiritual accounting, King is loud, crude, and self-serving in his dispatches to American religious periodicals. (Heyrman suggests that King would have made a successful dime novelist in the American West of the late 19th century.) King’s private journals have never been found, which means that we don’t know whether he shared any of the doubts that so vividly defined Fisk’s engagement with Islam. But on the basis of King’s dispatches from Palestine, Heyrman views him very differently from her hero: He becomes the brash American to Fisk’s sensitive cosmopolitan. It’s odd that after paying such close attention to Fisk, Heyrman would present Jonas King as the figure who really mattered. Although King’s dispatches clearly drew an audience in the United States, American and British missionary organizations pivoted away from engagements with Islam after 1830. Even during the 1820s, when King’s clumsy dispatches made their way into American magazines and newspapers, most US observers were interested not in the travails of the missionaries, but in the dramatic uprising of the Greeks against Ottoman rule. The Greek war of independence began soon after Fisk arrived in the Middle East, was still ongoing when he died in 1825, and outlasted King’s four years in the region. (The Greeks prevailed in 1832.) As was their custom, Americans were fascinated by another people’s struggle for independence. They were also happy to anatomize the religious backwardness of the Turks. But because the Greeks had never been forced to embrace Islam, American magazines and newspapers couldn’t find easy evidence of a holy war in the Peloponnese. Some American commentators thought that the modern-day Greeks were as superstitious and unrefined as their oppressors. Most were content to tally and condemn Ottoman despotism, like the piracy of the Barbary States, without undue emphasis on the eternal battle between the Cross and the Crescent. Against the backdrop of these dramatic events, which drew an American audience far beyond evangelical circles, the pioneering missions of Fisk and King were a sideshow. In the same vein, it seems a stretch to sift the dispatches of the two men for the origins of American Islamophobia. For one thing, as the remarks of Trump and Dawkins remind us, evangelical religion has no monopoly on the production or dissemination of hostility toward Islam. Even among those conservative Christians who have been fiercest in their assault on “Islamofascism”—Franklin Graham, say, or John Hagee—there’s a clear reliance on an apocalyptic strain of Protestant thinking that was fashioned in the late 19th century and forged by the struggles of Israel in the 20th. Tracing the roots of our contemporary problems to a largely forgotten past is one of the most important things that a good work of history can do. But American Apostles makes a lasting contribution in a very different register: It reminds us that, in attempting to remake foreign worlds and peoples, even the most ardent crusaders can have second thoughts.